Everybody knows natural stone tiles look great, creating a timelessly elegant look. Whether you’ve chosen marble, limestone, travertine or granite, they add an extra dimension of luxury and class to any bathroom or kitchen. They’re so stylish that they’re even starting to appear in living spaces like lounges, dining rooms and hallways. But are they really practical for everyday life in a typical family home? There are several common misconceptions that often cloud people’s view of stone flooring; have any of these been holding you back? Stone conducts heat away from the body so it will usually feel cool underfoot. However, this conductivity means it warms up if the room is warm, so it will only be ‘cold’ if the room is unheated and uninhabited for a while. If you’re really worried about the cold, consider underfloor heating. Admittedly some polished tiles would likely be slippery when wet – but stone tiles designed specifically for bathrooms will have a textured, non-slip surface. Remember any tiles likely to get wet frequently will need occasional resealing. Prices start at under £10 per square metre, which is very affordable. Of course, you always get what you pay for and premium quality is well worth the extra money; but even then, it would be affordable in a smaller room, and will of course last for many years. From pristine white marble to pure black granite, and a range of browns, silvers, beiges and blues in between, there’s a stone for practically any colour scheme. They can also be dotted with fossils and intersected with veining for a beautiful natural finish. What’s more, there are practical benefits to choosing stone tiles over carpet and many other floor coverings. Firstly and perhaps most obviously, it’s really durable. After millions of years being compressed into its current form, harder stones can withstand many years of footfall before it starts looking worn and tired. Even then, a visit from a stone restorer will have it looking good as new. With the right sealing, stone can also withstand spillages in the kitchen if they’re wiped up immediately. As for scratches, it depends on the stone type – but it’s rare to see damage that can’t be polished away. Like wood or laminate flooring, stone can also be beneficial to families concerned about allergies – it doesn’t harbour dust mites or pet hairs. In kitchens and bathrooms it’s also a hygienic choice as long as it’s properly sealed and maintained. If you’re considering natural stone tiles for your home, it’s vital that you get the advice of a specialist who knows the unique characteristics of each stone. They will advise on the best material and surface finish for the purpose you have in mind, as well as providing installation and maintenance tips, to ensure you get the desired effect now and for years to come. Visit the Advice section at Stone Superstore for more information. Yes, natural stone can look beautiful. I prefer the larger tiles and those with more texture. The major cost when it comes to stone (or porcelain tile) is the labor (not the stone itself). We also preferred stone flooring for better grip and nowadays stone tiles are available with different styles, shapes and color as the customer needed for their flooring. 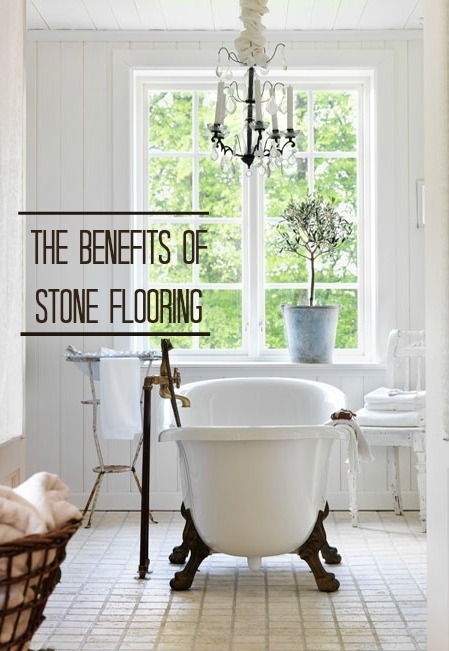 Stone flooring is usually better for bathroom floor and as well as garden floor & from your blog we come to know about the other misconception the people have. Thanks! Keep blogging! Yes, natural stone can look beautiful. I prefer the larger tiles and those with more texture.